Photographer Lisa Thompson’s inspiration for this exquisite creative shoot came from the works of her favourite Pre-Raphaelite artist, Gabriel Rossetti and his “La Ghirlandata” that depict a beautiful woman immersed in nature, surrounded with grandeur and fantasy. 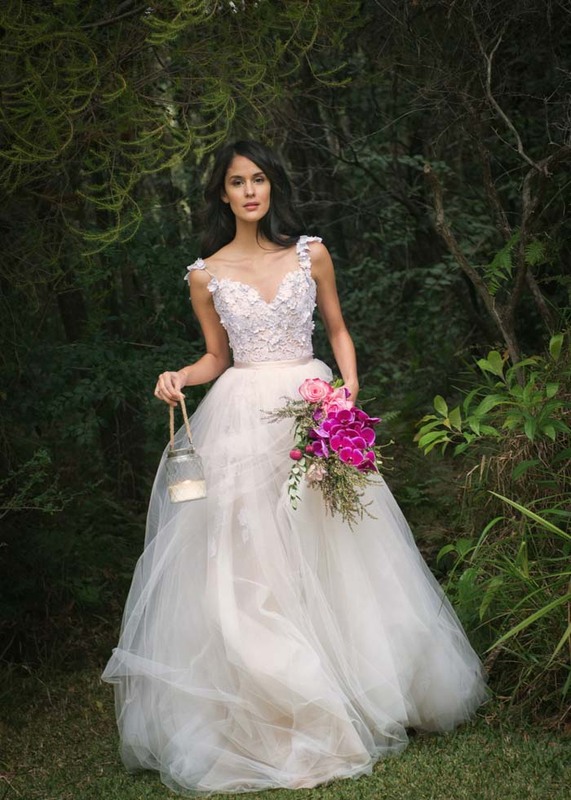 The shoot is set in the stunning Australian native bush and and is perfected with blooming florals by Maria Lush, stunning natural light and dreamy Louise Alvarez Wedding gowns. Florist Maria Lush created unique and exquisite flowers to add to the fanciful feel of the shoot. Bold colours are used in the unique hand-made floral headdress which is made of elegant phalenopsis orchids, cymbidium orchids, protea, peony roses and calla lilies. Louise Alvarez Couture’s newest collection is featured throughout this beautiful shoot. Stunning lace, antique fabrics, intricate beading and breath-taking shapes imbue the collection and make each of the dresses utterly unique. Victoria Buckley’s fine jewellery adds a sense of romantic majesty with through a mix of ruby jewels, diamonds, rose and white gold. Makeup artist Cathy Tolpigin created a fresh natural look using luxury organic makeup. The look is soft and understated, with a light plum lip tint to compliment the colours of the Australian native beautiful flowers. Hairstylist Kristine Bisson created a natural soft curl that was free to blow gently in the wind. The shoot culminates in a whimsical pairing of stunning flowers draped over a wedding dress. The image invokes romance, magic and and the extravagant fantasy of a floral princess in her blooming gown leaving a soft trail of rose gently drifting with each delicate step towards lifelong happiness.